Crank Crank Revolution: A Blueprint To The White House: Is The Selection of Paul Ryan A Good Thing? A Blueprint To The White House: Is The Selection of Paul Ryan A Good Thing? 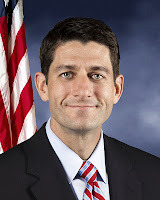 If you haven't yet heard the news today, the Mitt Romney campaign has selected Paul Ryan to be his running mate. He had been on the media's short list for a while--along with Bob Portman and Tim Pawlenty--so it isn't a total surprise. Still, in some ways it's a post-Palin safe choice, while in others it's quite risky. So, at first glance, was it a good choice? First things first: vice presidential picks don't really win or lose elections. At least not anymore; at one time "regional balance" probably had much more of an effect than it does now. And it's not like it doesn't affect things now, but the impact is much less than it used to be. Joe Biden didn't win or lose President Obama any states; likewise, Dan Quayle didn't cause Bush to win (or lose, for that matter). Even polls suggest that Sarah Palin had very little impact on the final electoral tally, and in fact may have helped McCain--the people most turned off from Palin weren't going to vote for McCain anyway. Bill Clinton can pick another Southerner in Al Gore--picking a running mate from the same region was once considered a mistake--and it didn't really matter. So when it's all said and done, the impact of Ryan's selection will most likely be minimal. *He is from Wisconsin, a perennial swing state that, like Pennsylvania and Michigan, always still seem to end up voting with the Democrats. While the final votes in the past few elections have always been razor thin (Gore beat Bush in 2000 by a mere .22%, which in political terms is a rain delay) it's still gone blue each time. The state is also the home of many wildly progressive candidates, from Robert LaFollette to William Proxmire to Russ Feingold. Still, the demographics in Wisconsin are very similar to western Pennsylvania, Ohio, and (less so) Michigan. With such small margins in each of these states, the selection of Ryan probably will help one or even all of them. *He is a good, articulate speaker who does not appear to be prone to gaffes. After Palin, this is a clear necessity, and Ryan appears to be well in control of what he says and how he says it. *He has a lot of creative ideas, something lacking for many politicians. *His conservative credentials are solid, so the Tea Party faction will be satisfied. Still, his public service began before the Tea Party rose to prominence, so he does not owe them anything, unlike many other current candidates. He also voted for TARP (hated by the Tea Party) and directly accused the military for budgetary indiscretions, showing that he's not afraid to challenge his own side. *He is known primarily for his fiscal strengths. He started out working for supply-sider (and fellow Vice Presidential nominee) Jack Kemp, and his entire public persona is based on his budgetary proposals. His social policies and foreign affairs positions, while known (and is standard for Republicans), have never been a prominent part of his platform. While I'm certain that will change in the next few months, it looks like he mostly mirrors his own district for these issues. *This is a boring pick. Ryan doesn't add any strengths that Romney doesn't already have--it's not like Romney has a desperate need to back up his fiscal credentials. Many of his other choices, such as Marco Rubio (Hispanic, Florida), Condoleezza Rice (black, female, foreign policy), Nikki Haley (Indian, female) or Bobby Jindal (Indian) could fill in needs or reach out to new demographics. Sadly, the short list all included young white men in Midwestern states (Bob Portman in Ohio, Tim Pawlenty in Minnesota, and Ryan), a demographic that, while crucial (see point #1, above) probably could have been secured anyway. *The fact that Ryan is known primarily (really. almost exclusively) for his budget proposals is a drawback as well as a benefit. Because these are plans that have a lot of details, it's going to be easy to pick out details, display them out of context, and attack him relentlessly. In fifteen minutes I've written a half dozen attack ads in my head. This is going to end up being a huge deal, at least for the next week or so, but probably for the next few months. *Ryan was one of the main participants in one of the greatest tactical blunders the GOP has made in the past few years: the debt ceiling showdown. Ryan was on the side of forcing that showdown, which I reluctantly opposed. While I understood the reasoning--take the opportunity to make cuts now, since the opportunity may not come around again--I felt that it not only caused too much economic turmoil for what ended up begin very little if any fiscal benefit, it opened the door for the Democrats to (justifiably) do the exact same thing the next time they are in power. It was a politically stupid move that generated no benefit to anyone, and Ryan was in the center of it. This makes me question his political judgement. Will Ryan ultimately be a solid pick? My hunch is that it won't matter. Paul Ryan doesn't really bring anyone into the mix that hasn't already decided for Obama or Romney; undecideds and independents aren't going to flock to Romney because he chose Ryan, nor are they going to run away. While I think the fact that he chose a Midwesterner is probably a good thing electorally, my fear is that he chose him primarily because he wanted to satisfy the more conservative factions of the party, blind to the fact that they don't need to be placated (they're not going to vote for Obama anyway). To be fair, I don't think there was any vice presidential candidate that would sway that much either way (with the possible exception of Rubio), so it's not like this is some huge, game-changing decision. Picking Ryan was less about adding new voters to the GOP side and more about showing that he wasn't going to pick another Sarah Palin. Personally, I like Paul Ryan's fiscal policy stances, but I don't think that he will matter one way or the other electorally. Ryan is a policy wonk, and while he is a good speaker, I'm not sure if he's a national enough figure to be a particularly effective campaigner. For that, we will have to wait and see, and that may be what converts him to a solid benefit instead of the neutral factor he seems to be at the moment.